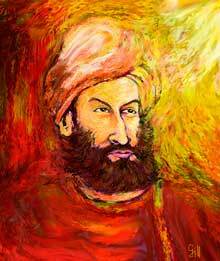 Mir Taqi Mir (sometimes also spelt Meer Taqi Meer), whose pen name was Mir, was the leading Urdu poet of the 18th century, and one of the pioneers who gave shape to the Urdu poetry and Urdu language itself. He was one of the principal poets of the Delhi School of the Urdu ghazal and remains arguably the foremost name in Urdu poetry often remembered as Xudā-e suxan (god of poetry). His philosophy of life was formed primarily by his father, a religious man with a large following, whose emphasis on the importance of love and the value of compassion remained with Mir throughout his life and imbued his love poetry. Mir's father died while the poet was in his teens. He left Agra for Delhi a few years after his father's death, to finish his education and also to find patrons who offered him financial support. Mir Taqi Mir lived much of his life in Mughal Delhi. However, after Ahmad Shah Abdali's sack of Delhi each year starting 1748, he eventually moved to the court of Asaf-ud-Daulah in Lucknow, at the king's invitation. Mir migrated to Lucknow in 1782 and remained there for the remainder of his life.